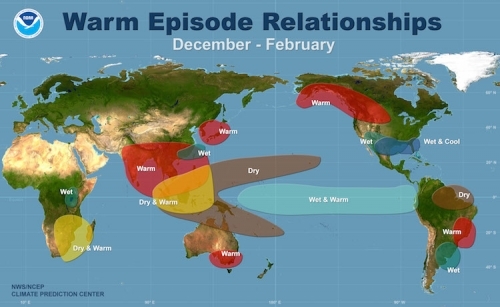 For months now, the tropical Pacific Ocean has been flirting with blossoming into a full-fledged El Niño state: Waters off the coast of South America have warmed, a hallmark of the climate phenomenon, but then cooled, only to warm once again. Winds, which normally blow east-to-west have made tentative moves in the other direction, another key criteria, but the bottom line is that the whole El Niño package hasn’t come together. So, is this El Niño going to happen or not? “Most likely” is the answer from forecasters with the National Oceanic and Atmospheric Administration’s Climate Prediction Center and the International Research Institute for Climate and Society at Columbia University, who issue monthly forecasts. Whether or not the El Niño forms, when it does so and how strong it is has a bearing on the weather and climate impacts it can have around the world. It is thought that even the neutral-but-tending-toward-El Niño conditions in place right now are helping to tamp down Atlantic hurricane activity, but only strong El Niños are linked to enhanced rains in Southern California, which the state desperately needs. The latest update, issued Thursday, notes that some aspects of the tropical Pacific’s behavior look more promising than they did at the time of the last update in early August, but keeps the likelihood of an El Niño developing at 60 to 65 percent. “We still believe that the event will occur,” CPC forecaster Michelle L’Heureux told Climate Central. Sometime in the September to November time frame, the CPC forecast said. Once the El Niño does form, it is expected to continue into the early part of 2015. The event, though, is only expected to be a weak or moderate one, L’Heureux said. The temperature threshold that forecasters use to mark an El Niño is a warming of 0.5°C (0.9°F) — the sea surface temperatures in a particular area of the tropical Pacific must have met this condition for a month and be expected to do so for the next three months. Temperatures have hit that mark, but then were not expected to persist, and over the summer, they even cooled somewhat. Things seem to be back on track now, with temperature differences hanging around the 0.5°C mark. This is also where most models have been hovering in recent runs, just eking past the El Niño threshold. The recent warmer waters came after a burst of westerly winds touched off what is known as a Kelvin wave, when warmer waters travel below the surface of the water from west to east. What exactly its full impact will be won’t be known until later this month or into October, though. El Niño watchers “have to be patient and see what happens,” L’Heureux said.